Red Sea Aiptasia X, 60 ml. In an exciting development for reef-keepers Red Sea has developed a unique patent pending formula to treat the pest anemones Aiptasia sp., Anemonia majano and Boloceroides sp. Red Sea Aiptasia X, 60 ml.. Existing treatments are often unsuccessful as when threatened Aiptasia quickly retract into holes in the rock and release planula (larvae) in to the aquarium which can rapidly develop in to full anemones. Additionally any part of the anemones body left attached to a rock can regenerate into a full anemone. Many treatments can therefore lead to a proliferation rather than the removal of Aiptasia. 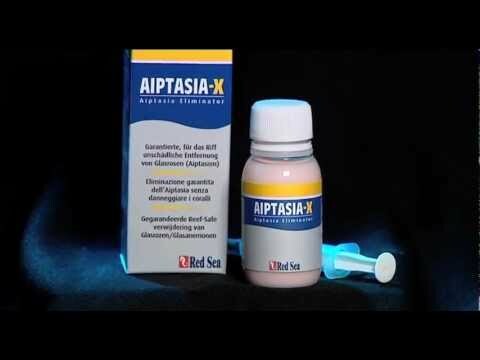 Aiptasia-X consists of natural components which form a uniquely thick, adhesive material. Instead of causing the Aiptasia to feel threatened, the unique formula is sensed as food stimulating the anemone to expand and ingest the material. The adhesive form of the treatment makes both the application of the material easy as well as sealing the anemones mouth preventing any release of planula. Within minutes of applying the material the Aiptasia will implode, eradicating both the anemone and its planula. Red Seas new treatment is completely reef-safe and any material not ingested by the Aiptasia is harmless to sessile invertebrates. Excess material will decay harmlessly over time without any adverse consequences. Questions on Red Sea Aiptasia X, 60 ml. I have used Joe's Juice and this product. But I would have to give the nod to this one because of the angled needle that comes with it. Makes it easier to reach some of those sneeky pests that can hang out on edges. it worked perfectly on my 12gal with only one treatment, but not so well on my 60gal. those lil nems came back in a little over 2 weeks. so simple to use. just turn off the powerheads and apply near the nems. the nem will grab onto it like its food. then shrivel up. treated 3 nems and have nearly the entire bottle still. i don't think a water change is necessary, but i did a small one just in case. everything including my corals, urchin, 11 fish, and shrimp do not appear to be affected. the zoas that were next to the nem (dead now) finally can bloom. I have always used Joes Juice and decided to try this. It is a very effective Aiptasia killer and the creatures don't seems to retract when hit with it. They stay out, take it in, and die. It also seems to congeal when injected and stays on the spot better. This is especially helpful on vertical surfaces or under ledges. The applicators provided are much more durable and useful that the competitors. You're reviewing: Red Sea Aiptasia X, 60 ml.